The Fourth District’s Officer Antonio Andino and Officer Erik Melendez visited Estabrook Recreation Center to hang out with the kids in the boxing program. The officers were on their own time and decided to check out the facility, where they talked about safety and the importance of doing the right thing, and took part in some of the boxing drills. 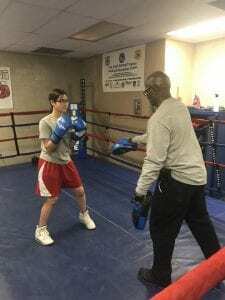 The Cleveland Police Athletic League’s director, retired CPD sergeant Bob Kumazec, was also on hand and showed off the new Cleveland PAL custom boxing gloves. Great job by these officers going out of their way to give back to our community! !